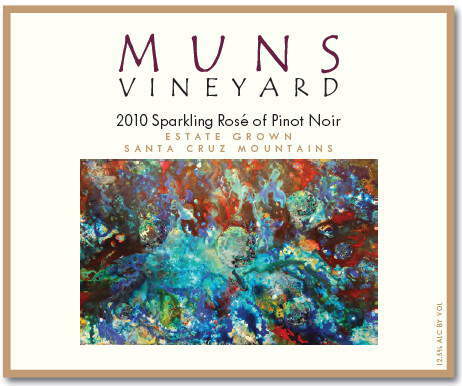 “Exceptional.” – Rusty Gaffney, ‘The Prince of Pinot’, in PinotFile about the 2009 Muns Vineyard Pinot Noir. Our Pinot Noir and Syrah reflect the rugged, high elevation terroir of our vineyard, at 2600′ elevation on the Loma Prieta ridge top, the highest vineyard for these winegrapes in the Santa Cruz Mountains. Our Pinot Noirs are characterized by flavors of dark cherry, spice and earthy notes. The tannins are distinctive, provide the structure for a well-balanced wine and bottle aging, and are ameliorated during the winemaking process to result in a smooth, velvety mouthfeel. Each vintage is different, influenced by that year’s climate and the impact of bottle aging (and our wines are made to age), but the basic characteristics can be defined throughout. We currently have available the 2009, 2010, 2011, 2012 and 2013 vintages; plus Library vintages of 2006 and 2007 (the 2008 is sold out). See the Wine List below. As well, we make a Rosé of Pinot Noir each year. The 2017 is sold out – but we will have more available early Summer 2019 with the 2018 vintage. Our Syrahs are characterized by rich blackberry balanced with the earthiness of black olive and the meaty character of the Northern Rhone. We currently have available the 2013 and 2018 vintages.See the Wine List below. The mouthfeel of our wines is a sensory experience with soft and velvety tannins. Tannins and acidity are balanced, with the minerality typical of the Santa Cruz Mountains and our vineyard. Enjoy our high elevation wines from our ‘vineyard in the sky’! Our Pinot Noirs are a blend of four Dijon Pinot Noir clones designated for premium dry wine: 114, 115, 667 and 777. In addition, these four clones are planted on three different root stocks. What Bordeaux achieves with blends of Cabernet Sauvignon, Merlot, Cabernet Franc, Malbec and Petit Verdot, we achieve wholly within the Pinot Noir variety, using clone/rootstock combinations which each exhibit unique characteristics. The resulting Pinot Noir “blend” is a complex portfolio of rich color, flavors, aromas and robust structure. At harvest, the crushing operation gently separates berries and stems producing the must that is fermented in chilled stainless steel tanks. Some juice is drawn off and cold-fermented for our Rose‘. After fermentation is complete the juice is gently pressed off to settling tanks, then gravity-fed into oak barrels, 30% of which are new Hungarian oak, with its tight grain that imparts more subtle tannins. As the wine ages in the barrels, for 16-18 months, it is stirred occasionally but no racking is done. This imparts soft tannins that accentuate, but not dominate, the wine. Finally, the wine is gravity-fed into the bottling line so as to minimize “bottle-shock”. This minimal-intervention winemaking style along with the barrel choice supports and highlights the delicate nuances of flavor in the Pinot Noir (and our Syrah) . Our Syrah is a blend of three different Dijon clones: 383, 470, 525. 2014 ~ Released Fall, 2018. 2013 ~ 110 cases produced. Released Fall 2017. Tasting notes here. 2012 ~ 269 cases produced, bottled June 2014. Tasting notes here. 2011 ~ “Classic”. 136 cases bottled Spring 2013 and released Fall 2014. Tasting notes here. 2011 ~ Native Yeast Fermentation. 80 cases produced, released November 2012. Tasting notes here. 2010 ~ 250 cases produced, released September 2013. Tasting notes here. Sold out. 2009 ~ 242 cases produced, released November 2012. Tasting notes here. 2007 ~ 150 cases produced, released in Fall 2009. Tasting notes here. 2006 ~ 360 cases produced, released in June 2008. Tasting notes here. 2005 ~ 180 cases produced, released in March 2007. Tasting notes here. 2017 30 cases produced, released Summer 2018 Sold out. The 2018 vintage will be available early Summer 2019. “Crisp and dry, it’s a refreshing delight on a summer’s day—and it’s perfect to pair with picnic fare and appetizers.” – Josie Cowden in Good Times Santa Cruz. Our 2010 vintage Sparkling Rosé of Pinot Noir, Estate, is a dry sparkling wine (Brut) made in the méthode champenoise style. It was harvested at 19 brix in September, 2010 and has the beautiful Rosé color distinctive of a Pinot Noir-based wine. This lovely sparkler is dry and crisp yet with beautiful fruit on the palate. Enjoy a taste of the stars from our vineyard in the sky on the Loma Prieta ridge top. $50, available only direct from Muns Vineyard. Limited availability. Original artwork, ‘Blue Sky Temple’ on the label by W.M. Vinci. 2014 ~ Released Summer, 2018. 2012 ~ 98 cases produced, bottled 25 November 2014. Tasting notes here. Sold out. “…given time to unwind, opens up to your senses. Dark fruit, oak and earth reflect the grace and strength of this syrah, grown on one of the tallest peaks of the Santa Cruz Mountains overlooking Monterey Bay.” – Stacey Vreeken, Santa Cruz Sentinel. *15% discount for 6 bottles; 25% discount for 12 (mixed selection is okay). Sign up for our Muns Vineyard Wine Club. There is no charge to join the Wine Club, and you save on your purchases, from 20-30%. Enjoy our vineyard tastings with no tasting fee, and we will also waive the fee for two friends (normally $10/person). Wine Club memberships make a wonderful gift – for yourself or the wine lover on your list. – At 3 bottles quarterly: you get a 20% discount on those shipments and all purchases less than 12 bottles; 25% off case purchases; and 33% off purchases of 3+ cases. – At 6 bottles quarterly: you get 25% off those shipments and all other purchases; 33% off purchases of 3+ cases. – Get a case quarterly: you get 30% off that shipment – and all other purchases! 3+ cases get 33% off. Find the Wine Club form here to sign up. Like many small wineries, we make our wine by custom-crush at a neighboring winery. Through the 2004 vintage our wine was made at Soquel Vineyards by proprietors/winemakers Paul & Peter Bargetto and Jon Morgan. From 2005 onward our wine has been made by winemaker Tony Craig at the Silver Mountain Vineyards winery facility.